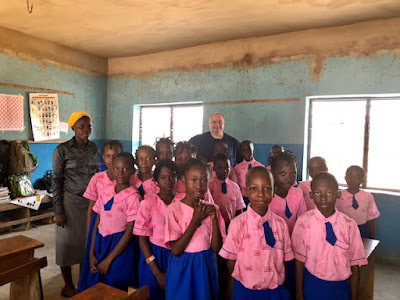 Thursday was our much anticipated visit to GoodNews Christian School in Abeokuta, Ogun State, Nigeria. It was an exciting day for us indeed! Bro. Shobanke shared with me that his late wife had carried a vision of beginning a Christian School in Abeokuta. When she passed away several years before, it seemed that her vision passed with her. In time, their daughters, Sis. Rebecca and Sis Ruth went to the university and God began to transplant the vision for the Christian school in their hearts. When Bro. Shobanke told me all of that in 2009, I was instantly 100% on board with the vision for the Christian school. We pledged $1000 for each of the first three years of the operation of the school. We honestly had no idea where $1000 would come from each year, but I believed the Christian school would have a huge impact and I wanted our family to support it. We did and we have been with them ever since. The school took off right out of the gate and each and every day they are affecting unchurched families and multiple muslim families that send their children to the school. It is a vast mission field. How do you change a nation that is mired in poverty and corruption? Can you legislate change? Can you mandate improvement throughout a whole society? I believe the way up, is to change one life at a time. They are doing that at GoodNews Christian School! They are doing it well. I told Bro. Shobanke today that it may be the single greatest thing that he and his people are doing to reach people for Christ. The children are receiving a good education and they are learning of Christ and the Bible too. That is a fantastic combination. The school has two pre-kindergarten classes beginning at two years old and then kindergarten. Once they reach level 1 the school goes through level 6. This year the school has expanded to level 7 and they plan to add a level each year until the students graduate at level 12. We call these grades high school but they refer to it as college. This is a huge step for the school and it demands they expand their classroom space quickly. Sis. Rebecca, Sis. Ruth and Bro. Samuel took us on a tour of the classes. 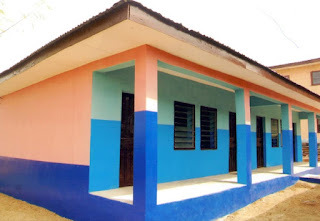 The first building is two stories with 7 classrooms. The grade 7 students are meeting in the church until the classroom space can be expanded. 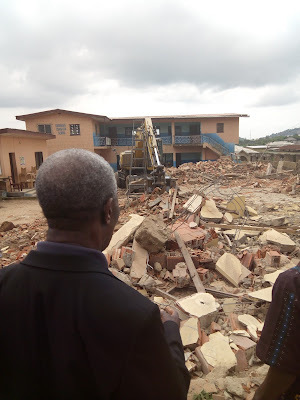 The building to my immediate right in the picture below is the two story building with 7 classrooms. This is the back of that building. The construction material was removed from the roof of another building and will be reused soon. The water tower was provided as a gift from the parents of the students. Now they have a good supply of gravity fed water even if the power is out. The grand finale was an assembly of all the students in the church. They presented a program for us and then I addressed them and prayed for them. One of the students was chosen to present a plaque to us and she brought me to tears. My eyes were leaking all over the place! Here is the group picture with me tucked into the middle. They were literally crawling all over me in excitement. This is the high school students. This is all of the staff at GoodNews Christian School. Everyone receives a couple of sweets. I believe this is the fourth year we have brought a piece of luggage stuffed to the gills with school supplies. We have sent a suitcase with other preachers two other years. Supplies that can be purchased in Nigeria are cheaper so we try to give them some money too. 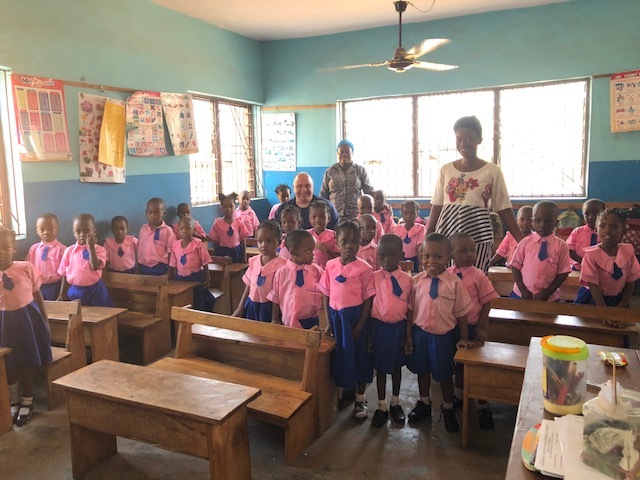 When we visited in 2016 they were building another building with two more classrooms. We left the money to complete that building and it was completed quickly. During a school break this year, they removed the roof of the new school building and poured a concrete roof. They also added on another room to the ground floor. 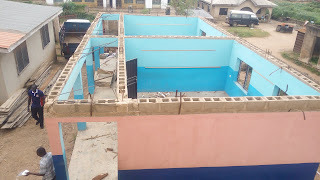 When it is finished this two room building will have six classrooms. The concrete on the second floor was completed by the time that school began again. This is the progress they have made since then. We left them a little money to work on the building, but not near enough to finish it. 2017 was a busy year on the school property. The original church had to be torn down because it was about to collapse. Through the help of God's people, we were able to send an offering toward the speedy rebuilding of the church. The new church was dedicated in December of 2017. I took this picture yesterday with Pastor Isaiah standing at the corner. I am so happy for him and his congregation. Here we are headed out the gate Thursday afternoon after about three hours at the school. Our hearts were full as we pulled away from the church Thursday. These dear saints are on the front lines for hearts and minds and souls. I feel like I am doing so little to assist them, but I intend to do my best to do my part. We absolutely could not have done what we have done before or what we did yesterday without individuals and churches that have purposefully given so that we could give. We get the hugs, pats on the back and plaques, but the credit goes to the people of God. Thank you! I appreciate you dropping in. I hope you enjoyed the visit to GoodNews Christian School at least half as much as we did!